e-envisioning an established franchise is a dangerous proposition. The previous (and not particularly forgotten) Batman movies have established a dark but somehow comedic universe, where the architecture has outlandish gothic overtones and where the criminals feel compelled to dress in bright, goofy disguises. Batman Begins turned that look on its heels, by turning Gotham City into a realistic city as you might find anywhere in America (although looking an awful lot like Chicago), and its criminals into dark and disturbed miscreants, no longer with marketing consultants. The caped crusader himself has been made more human – someone with a disturbed past and who battles with his own history as much as street criminals. In The Dark Knight, everything that made Batman Begins a success has been brought back, but bigger and better than before. Director Christopher Nolan has managed to create an uncompromising film that by all rights should never have managed to make it through the mass Hollywood machine. Similarly, if such a film were to have made it through it should never have become a commercial success. 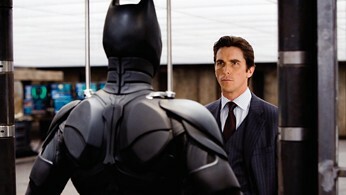 Somehow Nolan has managed to succeed on both counts, creating one of the most memorable – and by far the most successful – Batman movies of all time. The future of Gotham City is starting to look bright thanks to Batman’s tireless crime fighting. He, with the help of Lieutenant Jim Gordon and District Attorney Harvey Dent, hatch a cunning plan to round up the remaining criminal originations that plague the streets. But out of desperation, those groups enlist the help of a new sadistic evil mastermind, The Joker, who singlehandedly turns the war on crime back against the heroes. Will Batman defeat the forces of evil, or will the city simply turn against him? 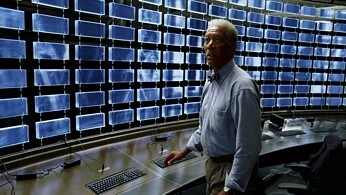 There’s no denying that The Dark Knight is a dark movie – and in this case I’m talking purely about picture quality. Quite a few scenes have a rather solid, inky black background completely void of shadow detail, but in those instances you aren’t actually meant to see what’s hiding back there. For the rest of the film, you’re going to want to make sure your display device is properly calibrated, since this movie is all about near-black shading and deep color. Surprisingly, the film does not come off looking drab or monochromatic, and is actually quite bright and vibrant when the scene dictates it. As with the IMAX theatrical presentation, The Dark Knight on Blu-ray is presented in dual aspect ratios: 2.40:1 for normal scenes, and 1.78:1 for all IMAX filmed scenes. This ends up working better than one might expect, somehow giving the IMAX sequences a “grander” appearance and more visually impressive, similar to how the original concept worked in the theater. Those of you who didn’t see the original IMAX version may find the aspect ratio switching an odd concept, but it’s more seamless than it sounds. Warner has given The Dark Knight an excellent VC-1 MPEG-4 encode, with the bitrate averaging 20-26 Mbps, with sustained peaks around 32 Mbps, occasionally rising to over 38 Mbps. Overall detail and clarity levels are beyond excellent, with no visible edge enhancement, dirt, noise or compression artifacts. Even grain is kept well under control at all times, despite numerous nighttime scenes. I’ve been a little disappointed by some of the Blu-ray soundtracks I’ve been listening to lately. Sure, most have been pretty good, but they somehow lacked that certain “something extra” that would make them spectacular. This movie has that something extra, and is audio truly worth writing about. The Dark Knight has one of the most impressive sound mixes of any modern move that I’ve seen, from a powerful orchestral score that sets the mood effortlessly, to enveloping surround sound that puts you square in the middle of the action, to robust and almost continuous subwoofer action that will make things in the room rattle that you thought were already nailed down. With a huge dynamic range that will have you jumping out of your seat, The Dark Knight’s audio is crystal clear and without peaking, static or distortion. Warner has outfitted The Dark Knight with a Dolby TrueHD 5.1 encoding that’s completely faithful to the original, as well as a “normal” Dolby Digital 5.1 track that seems rather pointless to even include. The default audio track is unfortunately regular Dolby Digital; TrueHD must be selected manually. If I had any complaint, it would be that some of the film’s dialogue was a little hard to understand, especially certain lines said by the gravelly-throated Batman. 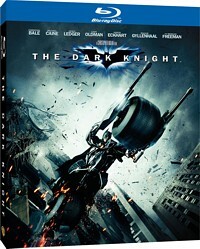 On Blu-ray, The Dark Knight comes in a 3-disc set. The first disc contains the movie itself, plus one bonus that relies directly on the film. The second disc features all other extra features, while the third disc includes a digital copy of the film that can be viewed on PCs, iPods and so forth. Gotham Uncovered: Creation of a Scene (1080p/2.0): This feature includes 18 “focus points”, which are mini behind-the-scenes documentaries detailing the creation of specific action sequences, complete with director commentary. These can be played individually, or integrated into the movie so that a pop-up icon appears when one can be played back. In total there’s over 80 minutes to look at here. Batman Tech (1080p/5.1): An interesting 45-minute documentary on Batman’s seemingly implausible technology, how it came to be, and how it all relates to real science. Batman Unmasked (1080p/5.1): This 45-minute documentary explores the psyche of Bruce Wayne and his transformation from billionaire Bruce Wayne into Batman, as well as motivation behind the villains of his world. Gotham Tonight (1080p/2.0): Six full episodes of the fictional tabloid-style television show as seen in the movies – there’s over 46 minutes here! All focus on Batman or Bruce Wayne, and are actually a little dull when viewed in a continuous stream instead of mere snippits. Galleries: Collections of still images, ranging from dozens of different Joker cards, to original poster artwork, production stills and conceptual artwork. Trailers (1080p/5.1): A complete collection of 3 theatrical trailers and 6 television spots. BD Live: This links to Warner’s BD Live website, which (in addition to being a sort of central clearing house for Warner’s online content, sales and promotions), includes features such as recording commentary tracks, organizing screenings of the movie, as well as some extra content related to the movie (mostly Batman “motion comics” in this instance). When I first heard about The Dark Knight, I knew that it was going to be something special. I originally saw the film during its theatrical run in IMAX, and was blown away by the whole experience. And yet, I had misgivings. The movie was dark. Very serious – at times brutal. Would it be something that I would really want to own and watch again? Fast forward some months later, after the Academy Awards where Heath Ledger won a well deserve posthumous Oscar for best supporting actor, and I just had to see it again. Without the huge publicity machine driving my expectations, I was able to truly enjoy the movie and see it for what it was, rather than what I’d been told to expect it to be. I noticed details that I had never seen the first time around, and was able to better appreciate the nuances of the plot, the amazing cinematography, and the complex score. Between the movie, the picture quality, the soundtrack and the range of bonus features, The Dark Knight truly is a showcase Blu-ray Disc that deserves to be in everyone’s collection. Highly recommended. One side note. As usual I obtained the Canadian version of the disc, all of which come with both English and French translations of the movie title, description, features and so forth on the outside of the box. In a creative touch, under the outer cardboard slipcover the back of the disc’s case has apparently been defaced by The Joker, who scratched out heroic words and added in mocking graffiti. And in true Canadian fashion, even the graffiti comes with a French translation!